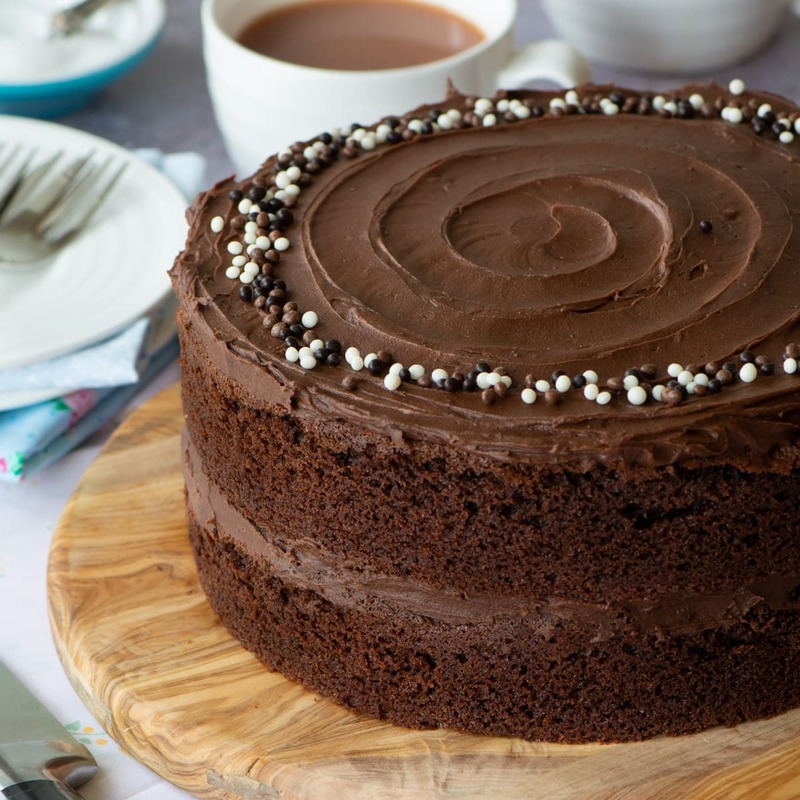 Today’s recipe is a variation on my popular Chocolate Birthday Cake Recipe, as with that recipe it can be made in pretty much any size of round, square or rectangular tin (see the handy calculator just above the main recipe). It’s incredibly simple to make. I’ve taken the Mary Berry approach to baking and kept it as easy as possible by making an all-in-one chocolate sponge cake. This means all of the ingredients (except for the melted milk chocolate) are added into the bowl and simply mixed together. The melted milk chocolate is then mixed in before baking. The melted milk chocolate is the secret to what makes this cake taste amazing. 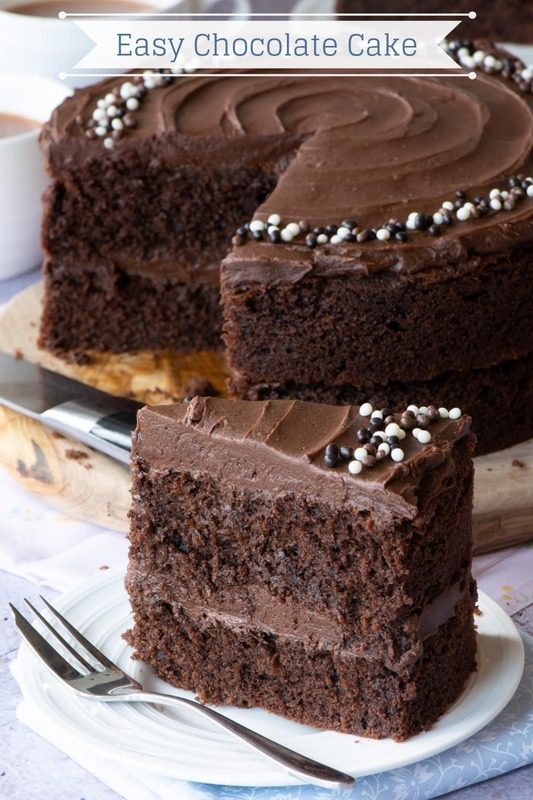 It makes the cake moist and ensures that it tastes really chocolatey, something I find isn’t always the case with cakes made with cocoa powder alone. When it comes to chocolate cake, it’s really the flavour that counts. However, if you want to neaten your cake up a bit then I think this swirl design is really effective, and it’s very simple to achieve. Cake decorating turntable – This sounds like a fancy piece of equipment, but it really isn’t. You should be able to get one for a few pounds. It isn’t essential, but it’s much easier to get a neat swirl if you have one. Once you’ve covered the top of your chocolate cake with chocolate buttercream, smooth it with a palette knife (it doesn’t need to be perfect just reasonably even). Pop the cake onto the cake turntable. Starting from the edge of the cake and working in. Slightly dig the end of your palette knife into the buttercream. Holding the knife steady, slowly spin the cake stand to create a circle. 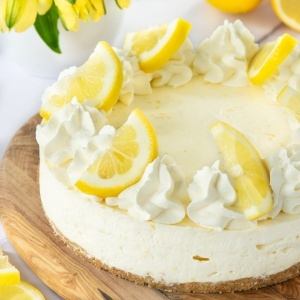 As you turn the cake stand, move the knife inwards slightly so that once the first circle is complete your knife is now just inside ready for the next circle. 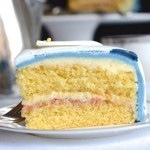 Keep rotating until the palette knife reaches the middle of the cake. I’ve finished my cake with some small round chocolate sprinkles. The great thing about this is that if you don’t get it quite as you want it the first time (I didn’t!) you can simply smooth it over with the palette knife and have another go. Can I use dark chocolate instead of milk chocolate? Absolutely. 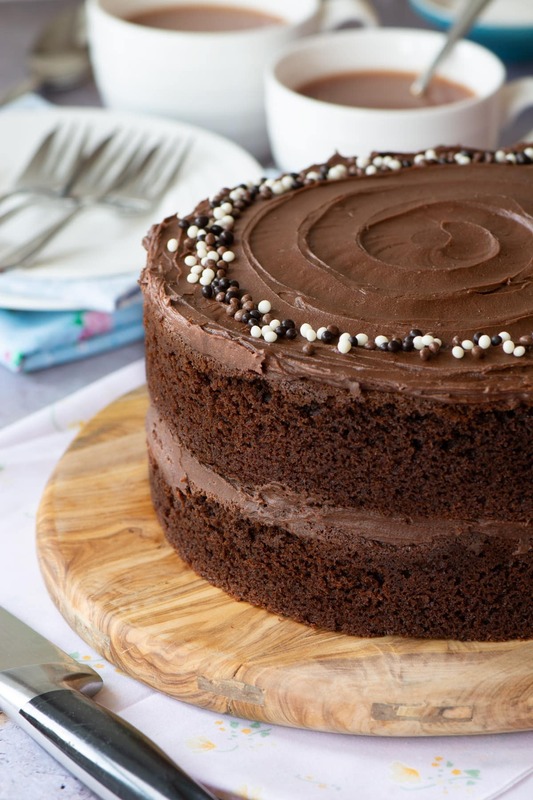 I use milk chocolate in this cake recipe as that’s what I prefer, but if you’re a dark chocolate lover then this works just as well using that instead. You can also use a mixture of the two if you’d like something in between. 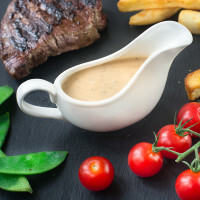 Can I use self-raising flour instead of plain flour? Yes, for the standard two-layer 20cm round cake recipe you switch the 190g of plain flour and 2½ tsp of baking powder for 200g of self-raising flour. How can this chocolate cake be stored? The cake can be stored in an airtight container for 4-5 days after baking. Ideally it should be stored in the fridge (although I’d recommend allowing your slice to come up to room temperature before eating as it will have more flavour and the buttercream will soften a little). If you don’t have room in the fridge it should be absolutely fine stored at room temperature as long as your room isn’t too hot (that’s what I always do with mine as I have a tiny fridge). This cake is suitable for freezing, either just the chocolate sponge or the buttercreamed cake. To freeze the chocolate sponge cake, wait for it to cool and then wrap the cake in clingfilm or store it in an airtight container before freezing. Defrost it thoroughly before decorating. The buttercreamed cake can also be frozen in the same way. I would not recommend freezing just the buttercream to use later as the consistency becomes a little too fudgey. This means it’s delicious on the cake but tricky to spread. What are the chocolate cake ingredients for a different size of tin? The main recipe below is for a two-layer 20cm round cake (this serves 12 people). However, this recipe is easily adapted to use other sizes of tins. To find the ingredients needed to make this cake in a different size, simply add the dimensions of your tin and the number of layers into the boxes below and hit “Calculate”. To keep this calculator from becoming too much of a coding monster behind the scenes I've only included metric measurements. If you would like US cups measurements for a different size of tin then simply calculate the metric measurements here and then pop the results into my grams to cups calculator and it'll tell you what you need. 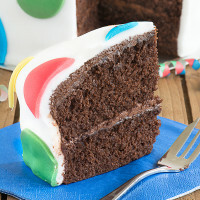 The US cups/ounces measurements for the original two-layer 20cm round cake recipe can be found by clicking the big green button just above the ingredients. What is the cooking time for a different size of cake and what oven temperature should I use? The ingredients are calculated so that the depth of each cake is the same as in the original recipe. This means that the cooking time and temperature don't need to change, so you can use what's listed in the main recipe. Can this cake be cooked in one deep tin? Theoretically yes, but I find I get the best results from using sandwich tins and this is what I would recommend. If you would like to bake the cake in a deep then the cooking time will need to increase to 45-50 minutes. 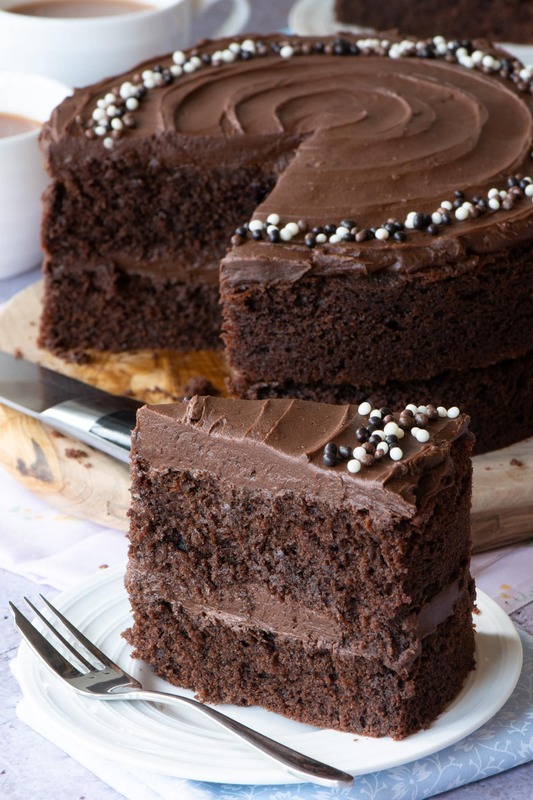 An easy chocolate cake that's moist, delicious and packed full of chocolate. This recipe makes a 20cm round cake. If you would like to make a different size of round, square or rectangular cake, you can find the ingredients you need just above the recipe. Pre-heat your oven to 160C/140C fan. Line two 20cm round sandwich tins with greaseproof paper or re-usable baking tin liners (I use these tins and these liners). Melt your milk chocolate (100g) - You can either melt it in the microwave (heat for 30 seconds, stir and then heat for a further 30 seconds. Repeat until the chocolate has melted), over a bain marie, or in a saucepan over a very low heat. Set the chocolate aside to cool. Put all of the other cake ingredients into a large bowl (190g plain flour, 2½ tsp baking powder, 40g cocoa powder, 230g caster sugar, 230g margarine or butter, 4 large eggs, ¼ tsp vanilla extract and 2 tsp milk). Beat together (either using an electric mixer on a low speed or by hand) until the ingredients are combined. Add the melted chocolate and mix in (again at a low speed) until combined. Split the cake mixture between the two tins. Smooth the mixture using a palette knife or the back of a spoon. Bake for 30-35 minutes until a skewer inserted into the centre of the cake comes out clean. 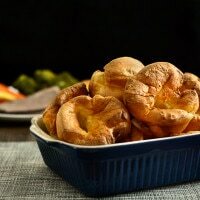 Once the cakes are cooked, remove them from the oven and leave to cook in their tins for about 10 minutes before removing them from the tin and moving to a cooling rack to cool completely. Melt your milk chocolate (150g) and set aside to cool - It is essential that the chocolate has cooled before it is combined with the other ingredients so it doesn't melt the butter. Beat the butter (250g) until soft - This can either be done with an electric mixer at a low speed or by hand. Add the icing sugar (250g), cocoa powder (40g) and vanilla extract (¼ tsp) and beat together on a low speed until combined. Slowly add the melted milk chocolate and beat until combined. Your buttercream needs to be a spreadable consistency. If it is a little too thick, beat in a little milk (no more than 1 tsp at a time) until it reaches your desired consistency. Place the bottom layer of chocolate sponge on to your serving dish. 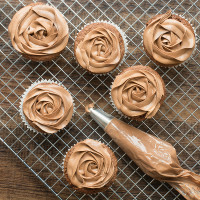 Spread half of the chocolate buttercream onto the bottom layer using a palette knife or the back of a spoon. Add the top layer of chocolate sponge and then spread the remaining buttercream on top of the cake. To create the swirl effect shown in the pictures have a look at my tips above the recipe. See storage and freezing instructions above the recipe. 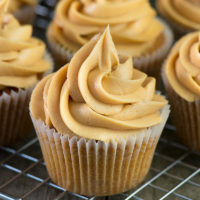 The ingredients I used to make this recipe are all free from the following allergens. However, please check any labels carefully for allergens you need to avoid as brands can vary, and product recipes can change over time. 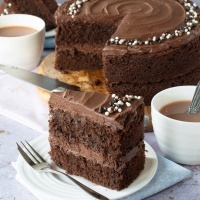 This cake can be made dairy-free by switching the butter/margarine for a dairy-free alternative (I like to use Pure Sunflower), using dairy-free dark chocolate, and switching the milk for a dairy-free alternative. 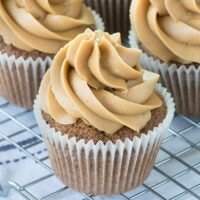 For the buttercream, take a look at my dairy-free chocolate buttercream recipe, which has full instructions. Cake and icing were phenomenal and my whole family loved it! When I was weighing the ingredients I put the cocoa powder, flour and sugar in the same bowl and as I had finished I realised I used self raising flour so I had to start again with plain flour. I still have the mix of self raising flour, cocoa powder and sugar so could I make the cake again but without baking powder? Yes you can. Add an extra 10g of self-raising flour (to make up the weight of the baking powder you’re leaving out) and it should turn out just the same. Fabulous. It’s been my turn to make a cake for work for a while, so was really pleased to see this recipe in your newsletter. I took it into work today and got loads of great comments, everyone said I was a secret pro baker ‍! Thanks Charlotte. Made this cake last night, gobbled up by the office this morning. Compliments all round and tasted delicious. Nice easy recipe to follow. Melting the chocolate was much easier than grating it (from Charlotte’s previous recipe) and the result was awesome. I did add a little extra milk to the cake mix as the mixture seemed a little thick to what I’m used to. The swirl pattern on top was also easy to do following the tips at the top. I added crushed up crunchie bar to decorate, really happy with result. Another fab recipe -thanks Charlotte. I’d had a few comments, that grating was a bit of a faff so I wanted to make something a bit easier. I’m so pleased it worked for you. Me know how much of the ingredients I will need to make the chocolate cake as cupcakes and how long I will need to bake them for. 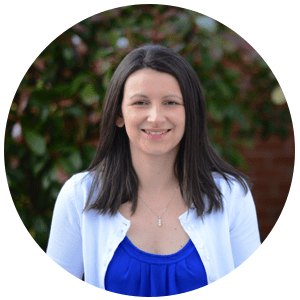 You can find all the info you need here. Absolutely delicious, it tastes really chocolatey. I’ve tried a few of your recipes now and they always turn out great. Keep up the good work Charlotte. Lovely recipe but I really like being able recalculate for a different size cake. Thankyou for this brilliant feature. I’m sure I’ll make good use of it. I asked last year but you were obviously busy. I can’t eat butter cream. 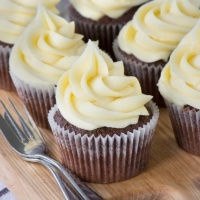 Do you have a recipe for fresh cream chocolate flavour for filling and frosting please? I’m sorry about that. It’s possible my computer decided to send it to spam as it does that occasionally sometimes so I didn’t see it. Are you after something thick like a chocolate ganache or something lighter like a whipped chocolate cream? I wanted to make your chocolate cake and the coffee one later so perhaps a mousse type texture? Whatever would be better to hold the layers really. Something that is a little sweet and nice and choccy or coffee! I used to love the Sarah Lee chocolate gateaux before it was discontinued! 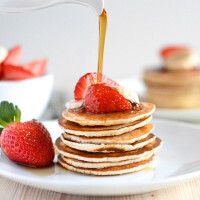 Believe it or not I don’t have a really sweet tooth, I always decrease sugar in recipes! Personally, I’d whip up some cream and just add a little vanilla extract (add a little at a time, taste and then add a little more if needed). 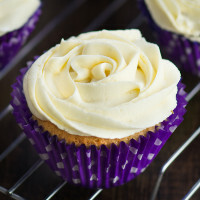 It’s not too sweet (as I don’t add sugar) but the vanilla adds a bit of extra flavour, that would go well with both the coffee and chocolate sponges. If your cream is too thick it sounds like you may have over-whipped it. When you’re whipping it, it’ll take ages to start to thicken, but once it starts it thickens very quickly, so keep a close eye on it and as soon as you see it starting to thicken, turn the speed down low (if you’re using an electric whisk). If it is a bit too thick, then the solution is to add a spoonful of milk and gently whisk it in. You should find that it softens the cream so it has a lighter whip and isn’t too thick. For the chocolate cake, you could also add some fruit compote with the cream and with the coffee cake perhaps a drizzle of caramel sauce for some extra sweetness.